While I read a lot of non-fiction, I don’t usually read biographies. 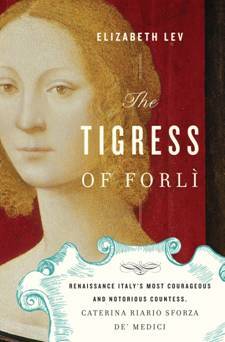 When I got the email looking for someone to review The Tigress of Forli: Renaissance Italy’s Most Courageous and Notorious Countess, Caterina Riario Sforza de’ Medici I was intrigued. Caterina Sforza was a wife, a mother, a fearless leader and a warrior. Born to a strong family who fought their way to power and prestige, Caterina was woman who could not only hunt and wield weapons, but control her emotions. At the age of 10, she was betrothed to a nephew of the pope. At the age of 14, she was sent to her husband, who proved over the years to be a bit of a worm. Italy during the Renaissance was in constant turmoil as the main cities fought over territories and influential positions were constantly ripped away from some and given to others. Being married into the Riario family, she was put right in the thick of all the mayhem and quickly took the reins of her family’s well being when necessary. After the murder of her husband, she seized control of her young son’s holdings. She later married a knight (Feo) and then late in life, found the love of her life (de’ Medici). Full of extreme highs and lows, she fought for everything and never backed down from a fight. Elizabeth Lev did a masterful job painting a picture of Caterina Riario Sforza de’ Medici’s life and times. Not only was it rich in detail of the life she lived, but she mentioned so many influential people in history that I want to do a full study in Papal history and the Renaissance. Not only was Caterina related to or at least well associated with several Pope’s, but she met many key Renaissance figures including da Vinci, Machiavelli, Botticelli, and Michaelangelo. A fascinating (true!) story of intrigue, politics, strategy, art, love and everything in between, this is a fabulous read for anyone who is interested in strong women, the Renaissance and Italy. Had I been able to read books like this in school, history would have been much more easily retained! I especially recommend it to anyone who enjoys historical fiction. This has all the elements of a historical normal with the added bonus of learning a lot about they why and how of the culture.